We realize that our customers sometimes have extenuating circumstances that prevent the timely payment of utility bills. 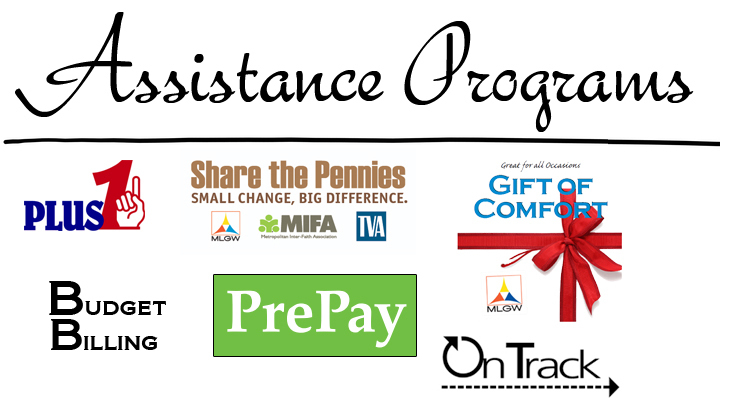 To help ease this burden, we've developed the following payment and assistance programs, as well as extension policies. For more information about these programs, call the Memphis Light, Gas and Water Customer Care Center at (901) 544-6549, visit one of our Community Offices or click on links below. Brochures are also available online for a number of these programs. In certain instances, MLGW may establish a repayment plan of a past due balance in addition to the regular utility bill. If you are retired or on a fixed income and receive only one check at the beginning of each month, you may qualify for this plan. You may request that the net due date on your bill be delayed until after you have received your check. MLGW will defer cutoffs for nonpayment for all residential customers between December 15th and January 14th annually. Customers must have an unpaid balance of $399 or less. This new program will allow customers to have extra cash during the holidays while protecting them from getting into serious debt. You may designate a third party for us to notify in the event of a pending service cutoff due to non-payment or insufficient payments. The third party will not be responsible for paying your bill, but will act as an additional communication link. Call (901) 544-6549 for more information.